Suppresses appetite – One of the biggest advantages of apple cider vinegar for weight loss is that is helps to curb appetite and produces a feeling of satiety. The satiety-increasing effects of apple cider vinegar can be attributed to its acetic acid content. Controls blood sugar levels – Sudden sugar spikes and crashes between meals not only increases insulin secretion in the body but also promotes sugar cravings. Apple cider vinegar helps to stabilize blood sugar levels by improving insulin sensitivity, which in turn makes it easier to stick to a normal healthy diet essential for weight loss. Impacts Insulin Secretion – Hormone insulin helps to regulate blood sugar levels in the blood. But excess insulin affects fat storage. It tends to store glucose in the form of fat. Apple cider vinegar helps to control insulin secretion by reducing sudden rise and fall in blood glucose levels. Prevents fat accumulation – The organic acids and enzymes in apple cider vinegar speed up metabolism and increases the rate at which your body burns fat. Acetic acid also suppresses fat accumulation and helps to reduce the level of cholesterol in blood. Cleanses the body – The powerful detoxifying property of apple cider vinegar helps to flush out the harmful toxins and waste products from the system which in turn improves bowel movement and aids better absorption of nutrients from food -all of which have a positive effect on body metabolism and weight loss. Start your day with a glass of the refreshing apple cider vinegar elixir and stay energized throughout the rest of the day. This delicious sweet and tangy beverage works is much healthier and tastier compared to soda or sugar-laden fruit juices and it has a plethora of health benefits. The combination of cinnamon and ginger enhances the flavors of the drink while the honey helps to balance the strong taste of the apple cider vinegar. The freshly squeezed apple juice renders and nice fruity touch to it. Apple – The soluble fiber pectin found in apple has the capacity to influence weight loss. Pectin absorbs water and forms a gel-like mass in the stomach and small intestine that slows down digestion and increases satiety. It gives enough time to the stomach receptors to signal the brain that the stomach is full and in turn the brain triggers the release of hormones that increases the sense of satiety. Pectin also aids blood sugar regulation that reduces the release of insulin in blood. Excess release of insulin promotes storage of fat in the body. Honey – Honey not only acts as a natural sweetener that enhances the taste of the drink, but also promotes weight loss by boosting body metabolism. It also possesses the ability to mobilize stored fat and make it available as a fuel for carrying out your daily activities. Give a healthful boost to your immune system and stave off cold and flu with this powerful apple cider vinegar and lemon ginger tonic. The blend of lemon juice and maple syrup give it a nice tart and spicy taste while the ground ginger enhances the flavors. The tart and sweet taste of the drink also tones down the strong taste of the vinegar. Lemon Juice – Lemon juice is a powerful antioxidant that promotes waste elimination in the body and flushes out toxins and excess fluid that helps in relieving abdominal swelling and bloating. Vitamin C found in lemon aids oxidation of stored fats in the body and makes it readily available as a source of energy. Ginger – The thermogenic effect of ginger activates the metabolism and helps in burning calories at a faster rate. The anti-inflammatory properties of ginger help to improve the functions of the digestive system. This soothing and refreshing apple cider vinegar green tea is more of a relaxing beverage rather than a detox drink. 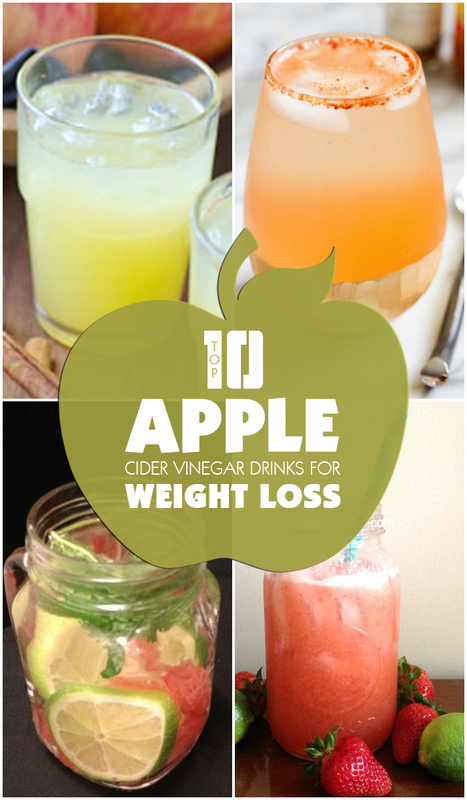 This apple cider vinegar drink is especially useful for relieving bloating and flatulence. It also helps to give an instant boost of energy and when taken between meals it helps to keep your appetite in check and prevents unmindful snacking. The cool and fresh flavors of the green tea perfectly balance the strong flavor of the apple cider vinegar. Green tea – Green is the healthiest beverage on the planet packed with antioxidants and bioactive substances that help in losing weight. EGCG (Epigallocatechin gallate), a catechin found in green tea has the power to boost metabolism so that your body burns calories even when it is at rest. EGCG also has the capacity to mobilize fat from the fat cells and make them available for use as energy by the muscle cells. Get refreshed and rejuvenated with this deliciously fruity and flavorful apple cider vinegar detox drink teaming with the flavors of blueberries. It combination of blueberries and maple syrup adds a mellow sweetness to the drink and balances the storing taste of the apple cider vinegar. The lemon juice adds a nice tanginess to the drink and enhances the flavors. Blueberries – Blueberries are extremely beneficial for weight loss. The catechins found in blueberries activate the fat-burning genes in the abdominal fat cells that help in reducing belly fat. Blueberries affect the way the body stores and breaks down sugar, which is also beneficial for weight loss. Maple syrup – Maple syrup id a powerhouse of antioxidants that helps to neutralize inflammation and damage caused by free radicals. It also helps is balancing blood sugar levels and controlling the release of insulin. Excess insulin in blood is directly linked to increased belly fat. It also supplies essential nutrients such as manganese, zinc, iron, calcium and potassium so that you don’t fall short on nutrients while dieting. This simple and easy lemon, chia and apple cider vinegar drink is a great way to start your day because it helps to kick start your metabolism, helps in relieving chronic heart burn and bloating and gives an instant energy boost. It is completely vegan and gluten-free. The chia adds a nice thick texture to the drink while the lemon juice adds a tangy-tart taste to it. Chia seeds – Chia seeds are a readily available source of nutrients that has numerous benefits for health. Chia seeds are packed with fiber and nutrients and extremely low in calories. It also contains a decent amount of protein. The protein and fibers found in chia seeds aid weight loss by drastically reducing cravings and appetite. The dietary fibers present in chia seeds help to improve digestion and regularizes bowel movement which also helps in losing weight. Start your day with this delicious apple cider vinegar drink that tastes almost as good as apple pie and get an instant boost of energy. The mouth-watering flavors of apple, cinnamon and vanilla completely hide the strong flavors of the vinegar while the apple juice dilutes its pungent taste making the drink more palatable and enjoyable. This recipe is especially suitable for those who are trying apple cider vinegar drinks for the first time. Cinnamon – This flavorful spice is beneficial for weight loss in several ways. First, cinnamon helps to control insulin levels in the body and regulate blood glucose levels. Increased insulin levels in the body causes excess fat to be stored in the abdomen, making it difficult to lose weight. Secondly, it speeds up metabolism so that your body burns more calories even when it is at rest. Thirdly, it suppresses appetite by slowing down the process of passage of food through the intestines which helps you to feel full for a longer period of time. 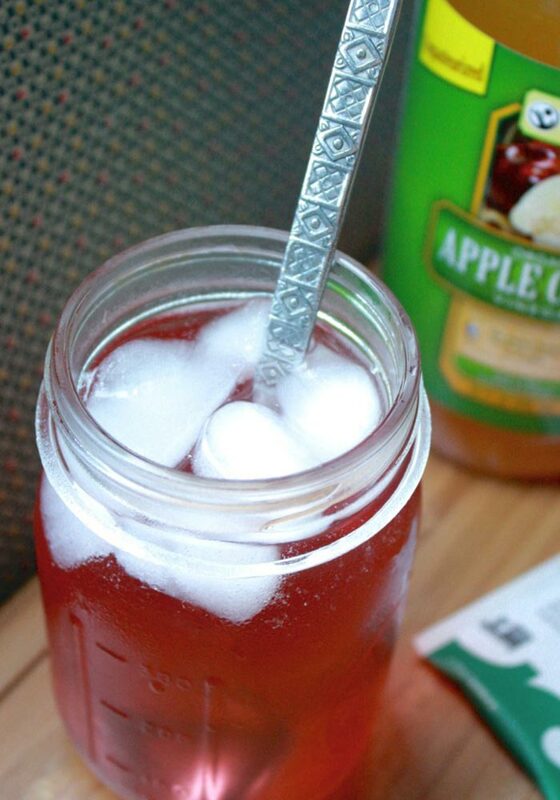 This apple cider vinegar detox drink comes straight from Dr. Axe and it consists of all natural ingredients. This effective detox drink helps to cleans and flush out toxins from the body, boost energy, promote fat loss and reverse diseases. The combination of lemon juice and cayenne gives a nice savory and tangy taste to the drink while cinnamon adds a refreshing flavor to it. Cayenne – Capsaicin, the main active ingredient present in cayenne pepper is a thermogenic chemical that speeds up your metabolism and promotes faster calorie burn. Research shows that cayenne pepper can increase overall metabolism by almost 25%. It also helps in curbing appetite so that you add empty calories by snacking on unhealthy foods. Replace your morning coffee with this delicious and power-packed apple cider vinegar drink and get an instant boost of energy to kick start your morning. It helps in strengthening the immune system and boosting metabolism so that your body continues to burn calories even at rest. The pineapple juice and lime juice work together to give a nice tangy taste to the drink, while the honey adds a mellow sweetness to it. Pineapple – Enzyme bromelain found in pine apple helps to relieve inflammation and promote digestion – both of which aid in weight loss. Most of us are unaware of the fact that inflammation is one of the leading causes of weight gain. Bromelain combat and reduce inflammation so that hormone leptin can work more efficiently to control body weight. Bromelain helps to relieve digestive problems such as bloating, gas and irritable bowel syndrome, which in turn aids the body to break down food and absorb the nutrients more effectively. All these things have a positive impact on your metabolism rate. This apple cider vinegar detox drink is loaded with cleansing and bloat-flushing ingredients such as grapefruit, lime and mint that help to give you a flatter tummy and a slimmer body in no time. It is a refreshing and flavorful drink packed with the fruity aromas of citrus fruits. 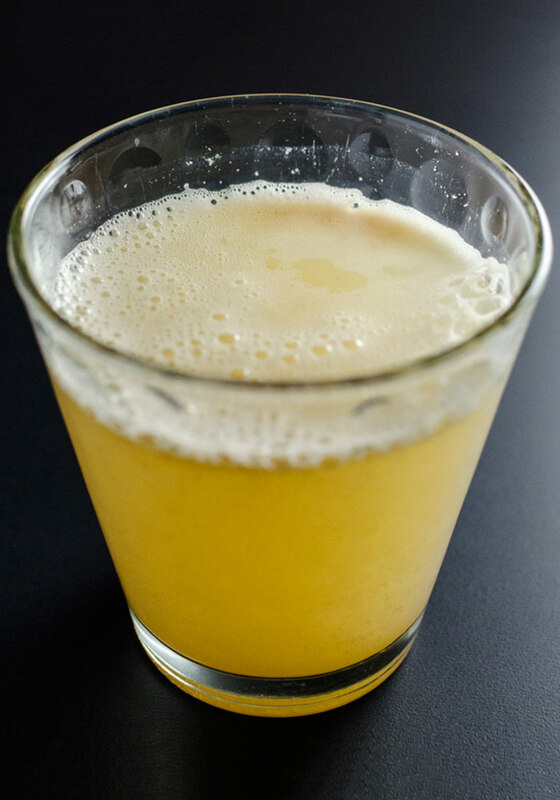 The citrus juices render a nice tangy taste to the drink and beautifully mask the pungent taste of the apple cider vinegar. Pink Grapefruit – Citrus fruits such as grapefruit and lime promote the functions of liver enzymes that breakdown fat. Grapefruit also helps in complete detoxification of the system. Because fat hold on to toxins, it becomes easier to get rid of these fats through detoxification. Potassium in grapefruit helps to restore fluid balance in the body and relieve water retention and bloating. Mint – The strong flavor of mint helps to control appetite and suppress cravings so that you don’t snack on unhealthy junk foods or sugar treats in between meals. Mint also has the capacity to calm down the gastrointestinal tract and assist healthy bowel movement which also helps in weight loss. This strawberry and lime smoothie is a healthy and tasty way to get in some apple cider vinegar into your diet. This pretty pink beverage is loaded with the goodness of strawberries, lime, ginger and apple cider vinegar. The tart-sweet taste of the berries balances the pungent taste of the apple cider vinegar and renders a sweet fruity aroma to it. The lime juice adds a touch of refreshing tanginess to it. Strawberries – These juicy red berries can promote weight loss in several ways. Strawberries increase the production of hormones that stimulate your metabolism and curb appetite. The fibers in strawberries slow down the rate of digestion of starchy foods. It also aids the weight-reducing hormones to work properly. Include apple cider vinegar in your daily diet and consume it first thing in the morning or a couple of hours before lunch and dinner in order to improve metabolism and enhance satiety which will help to curb your appetite and prevent overeating.